Dutchman Tom Dumoulin edged closer to victory in the Vuelta a Espana after doubling his overall lead to six seconds after stage 19. The Giant-Alpecin rider finished in 25th, 16 minutes and 18 seconds behind French stage winner Alexis Gougeard. But crucially Dumoulin finished three seconds clear of Italian Fabio Aru, his closest rival for the red jersey. It is 35 years since a Dutch cyclist won a Grand Tour, when Joop Zoetemelk won the 1980 Tour de France. 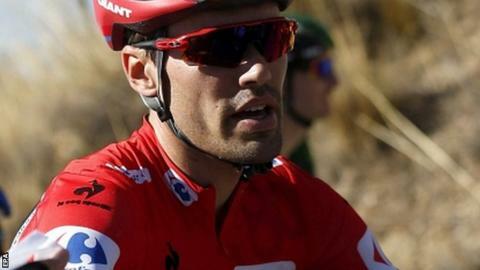 Dumoulin, a surprise contender for the general classification, took the lead with a scorching time trial on Wednesday and now has just one more competitive stage to negotiate, Saturday's mountainous 176km slog between San Lorenzo de El Escorial and Cercedilla. Sunday's final stage to Madrid is largely ceremonial and likely to be settled by the sprinters. "I attacked to try to win a few more seconds," said the 24-year-old from Maastricht, who along with Aru was involved in a minor crash earlier in the stage. "I am feeling very good. I was under stress because everyone wanted to attack me but I dealt with it well. "Tomorrow will be an exciting day when a lot of things could happen. My strategy will be to follow Aru and I will have to see with the team directors if there is any more we can do. "But my team is better than many people think and I hope they can show that." Gougeard, of the AG2R team, broke away to finish Friday's 186km ride from Medina del Campo into the walled city of Avila 40 seconds ahead of Portugal's Nelson Oliveira, with Belgian Maxime Monfort a further four seconds back in third. 3. Maxime Monfort (Bel/Lotto) +44"
7. Fabio Duarte (Col/Colombia) +53"
8. David Arroyo (Spa/Caja Rural) +1:03"
9. Christian Knees (Ger/Team Sky) +1:17"